From time to time, I will bring up the issue of invasive species, most recently in April regarding the armored catfish. The transference of a species from one ecosystem to another can cover great distances, such as with the lionfish of the Pacific but now growing in numbers in the Caribbean. Everything from animal larvae to seaweed can be transported via freighters either by attaching to the hull or inside the bilge. Nature can use various mechanisms to keep some species within specific territories; distance, temperature, predators, and the end results of years of evolution that can involve a variety of minute but important factors. And in some cases there is the natural boundaries established by depth. While ships, planes, automobiles, and even the careless aquarist can be methods of transportation for shallow water of coastal species, plants and animals at depth have a natural barrier to help keep species in place. But it's not always the case, as was recently discovered with the world-famous submersible, Alvin. As reported in the Conservation Biology journal, Alvin had been conducting deep sea missions around thermal vents in the Pacific when 38 small limpets were discovered attached to the submersible. Researchers examined the small invertebrates and were dismayed to find that they were actually a species from a different deep sea area of the Pacific, nearly 400 miles away, where Alvin had been previously. The greatest concern with the discovery was the fact that this particular species of limpet, Lepetodrilus gordensis, carries a parasite in as much as 90 percent of the population. Transferring this animal to other pristine deep sea environments could have disastrous implications. The researchers were a bit surprised to discover that the limpet had withstood the change of pressure from the deep depths to the surface. 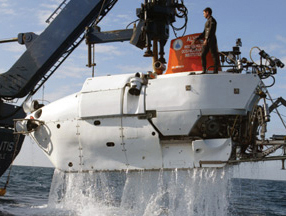 Alvin, owned and operated by the Woods Hole Oceanographic Institution, is typically cleaned after every dive, particularly around the equipment used to capture specimens. Sloppiness is definitely not part of the Woods Hole regimen, so addressing how these limpets managed to slip by is critical. Discussions are being held to consider more thorough cleaning procedures, including the use of fresh water, which can kill most salt water organisms. Deep water ecosystems, thousands of feet below the surface, are very isolated ecosystems, protected by depth and pressure, and therefore the consequences of introducing new species could be very disruptive. Researchers can not necessarily guarantee that there will be adverse effects, but it is certainly something that they would prefer not to have to deal with. "We know from shallow water systems that one mistake can completely change a system," said Dr. Amanda Bates from the University of Tasmania and one of the researchers involved. "The scientists themselves have to be better at not getting caught up in their research, just taking a step back and making sure that those jobs are getting done."